Where can we find the UK’s gardening hotspot? #infographic ~ Visualistan '+g+"
Gardening is one of Britain’s best-loved hobbies, and it doesn’t matter whether gardeners are attending to allotments, gardening for a living or spending time in their green space on a Sunday – Britain loves to spend time in the garden. Together with Compost Direct, retailers of grow bags, we’ve put together this handy guide to find out exactly where the best place in the UK is for those that are keen in the garden! It’s not just the type of property you own that impacts the size of your garden it’s also the date it was built; in 2004, homes built had an average size of 113.4m2. Surprisingly, only 18% of homes exceed this average. What this means is that the type of house and the year it was built are just important as each other. As well as property type and the year it was built, there’s also more to consider… rain. Britain is known for its wet weather – in the wrong location, too much rain could mean that your plants drown, whereas if there’s not enough – your plants may start to get thirsty! 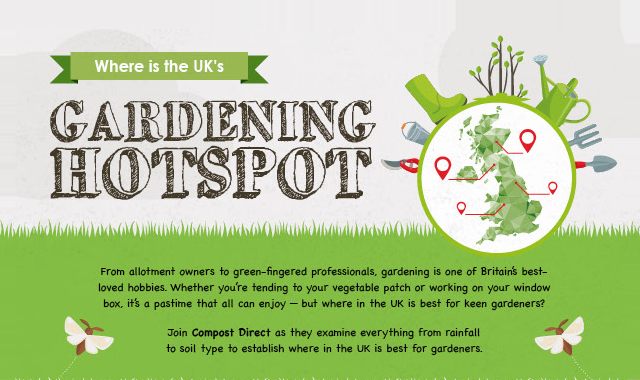 With the help of this useful infographic, you’ll be able to find out whether where you are in the UK is great for gardening, and where Britain’s best gardening hotspot is.